Temperance is one of my favorite cards. I find that there are certain symbols in Tarot that have come to have a deep resonance throughout my life. Some that I relate to easily, others that I have had to really work to understand and some where I have thought I'd seen it all and then they come back and surprise me. I often find that when this card is predominant in a reading that it indicates a sense of timing. The word Temperance comes partly from the Latin "tempus" and also "tempor", these are respectively timing and transformation. The balancing of energies and the moderation to work things through. A few things I have come to recognize as evocative on the card itself; the angel has one foot immersed in the water, the other seems to be hovering over the earth. The irises on the river bank, the careful flow of water between the cups, the crown of enlightenment at the end of the long road. As is the case with most cards, multiple signals that combine to give us a message. All of the major arcana cards are archetypes, universal symbols that hold within them a kind of guidance through our circumstances. If we were to view the minor arcana as karma, the majors are a sort of dharma that helps us free ourselves. Now that first word "karma" has been getting a lot of play lately. People look at a difficult person or situation and wish it to have some sort of karmic retribution. I'm not an authority on karma but the Buddhist traditions it evolves from tells us that we don't have to be victims of circumstance or fate. Karmic retribution is about as relevant to mindfulness as Santa Claus is to Christianity. Dharma is the teachings and beliefs that help us to work through karma. We can stop the retributive patterns at any time. 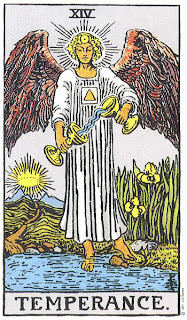 It is significant that the Temperance card comes up in the sequence of the major arcana after the death card, right before we face The Devil. Like a good guardian angel that walks with us through the scary stuff, Temperance is like the angel Virgil in Dante's Divine Comedy, helping us to see that all of our experiences, good and bad are part of what is shaping us. I like to think that we are all, and perhaps always will be, works in progress. The Maker's hand is still upon the clay. We can't just evolve the nice stuff and ignore what's in the shadows, Temperance is the compassion to work with all of that. It is "The Great Transformer". I don't think it is time alone that does this. Whoever said "time heals all wounds" had never heard of gangrene. It is time though that can wear down our hard shells of resistance. We aren't the people we thought we were a decade ago and hopefully we wont be in time to come. 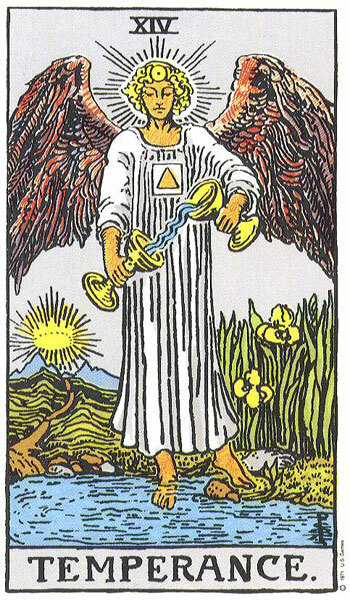 There is a reason Temperance comes after the egoic passing of the Death card. I am reminded of the common experience of many people who claim to have after death experiences. There is often a kind of life review where we see our lives play out from a detached perspective, we see the good and bad and these things arouse feelings but at the same time many of these people report a sense of being loved, held and protected as these things play out. I like to think of that as a higher nature or angelic awareness such as what Temperance shows. The angel of time is also an awareness outside of time, the all knowing that we are always a part of. On a much simpler level Temperance is sometimes looking at a situation that could have us all riled up in the moment and reminding ourselves of impermanence. It asks the question - how important will this be tomorrow, a year from now or ten? Temperance can be a need to slow down, to look at the timing of a situation. To put aside our egoic ideas of good guys and bad guys, to be compassionate with ourselves as well as others. When a troublesome situation comes my way I have to see the karma being as much my own lesson in dealing with it and not just my desire to have it come out my way. By the way, ever notice how no one much considers it was their karma that brought them the headache in the first place? No one deserves difficulties or pain, they happen though just like the weather. When they do Temperance is the awareness that we don't have to go flying off into reactions or a wish for retribution. We can learn from the situation, go into it's depths but also rise above it. We can be moderate. We can ask if there is a greater or a higher good than just our own immediate needs. This is challenging work, all of the majors involve some. In this case there is an old saying; "temper justice with mercy". As we move into any kind of inner work, we may have some bogey men to face, but Temperance is the higher awareness that lets us know we are on a good path, that we are not alone, and whatever we need to face is ultimately freeing us. Sometimes in a reading temperance is that third choice, somewhere between yes and no that says wait a minute or not right now. Being Temperate or moderate is a better place to work from than just being temperamental. There's more room and more of a sense of being a work in progress. We aren't as insistent on things having to be an immediate yes or no and that usually shows us possibilities we had never before imagined. "The happiest people I know are people who don’t even think about being happy. They just think about being good neighbors, good people. And then happiness sort of sneaks in the back window while they are busy doing good." - Harold S. Kushner, author of "When Bad things Happen to Good People". This picture came my way on another social media forum and I just have to share it. I don't know it's original source but it captures such a spontaneous sense of joy. 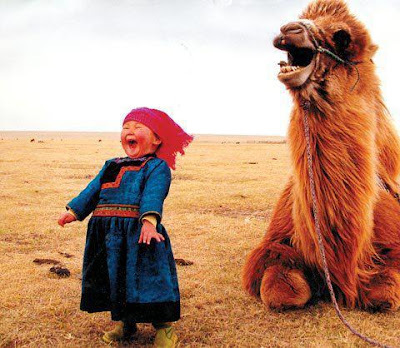 The camel and the child both seem to be sharing a great laugh.Sometimes the greatest things come right out of left field, the greatest realizations come when we are open. I have gone back and looked at this picture a number of times in the last day or so. It reminds me that real joy isn't something we have to send in our box tops for, it doesn't come from a lot of figuring out or from possessions or status. In Tarot, the Ten Of Cups embodies this, but it's sometimes misunderstood. The rainbow, a beautiful force of nature, is a tricky symbol. Just going through a storm doesn't necessarily guarantee you a rainbow. They don't come on order or from a sense of entitlement. They just are. This card is about our capacity for joy and the ability to share it. I've also experienced some storms that have been beautiful. I think the people on this card could be equally happy with a storm, or a sunset. Here in Winnipeg where you can get an old fashioned blizzard where an entire city gets shut down for a few days, you can curse about the weather or come to see the beauty in it. I think it comes down to having an attitude of gratitude. When this card comes up in a reading it can portend a very happy outcome and a sense of fulfillment. Not JUST things working out the way we want, but that sense of openness and joy that allows us to enjoy what is usually there waiting for us. The delightful little kid and the camel seem truly free to enjoy to enjoy themselves. Funny how so often there are those (like some kids) that have so little but that are able to see this more freely. The more we can have gratitude for what is around us, the more we can be open to joy. 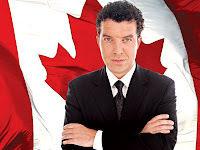 Weilding Swords (continued) court cards, conflict and communication and thank you Rick Mercer! This is a continuation of the previous article on some of the things that swords can represent - with some specific referance to the court cards - in a reading, along with some thoughts on communication and conflict that come to mind when I think of what this suit represents. There are some relationships and people that have an undercurrent of hostility. When the court cards of swords are reversed (or sometimes not necessarily physically reversed, but ill aspected) this is sometimes the case. The page of swords in this mode is like a child that feels a need to act up, disruptive and unaware of boundaries. The knight in this vein is "cruising for conflict". 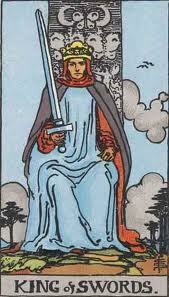 The King of swords (again in his negative aspect) is a sometimes abusive tyrant and the Queen can be quite cutting. The responsibilty to swords energy manifests strongly in communication. I have been more aware lately of this in social media which can be very much a swords based arena. Cyber bullying, political vehemence, sniping are rife on platforms like facebook. People like to expound on issues. It's like a personal soap box in a park with a megaphone. This can be a valuable tool, or a weapon depending on how it is used. Mercer, with his wit and strong articulation is a great example of healthy warriorship. His "rant" is not about being hurtful, it's about taking action, protecting and setting a healthy boundary. I would say he is a great example of a healthy, well aspected King of Swords.In a healthy, well balanced sense, the king is a discerning and diplomatic figure of authority. Someone who knows how to debate, make a point and be objective while still holding firm to principles. The queen is a judicial advisor, someone who knows the disciplined, sometimes "tough love" side of nurture. The knight is a rebel with a cause, a provocateur who isn't afraid of shaking up our complacency a bit. 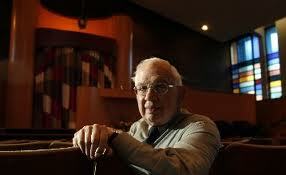 The page is a childlike protector, maybe, like a good little hall monitor, a voice worth heeding. Wit and articulation, discernment (over judgement) and the heroic quality of irony are all hallmarks of healthy sword energy. The qualities of good warriorship are evidenced. Much like someone who has long practiced the martial arts there is not a seeking out of conflict, but also not a shying away. Violence of any kind is a last resort, more often the ability, like a bull fighter to let an opposing force run itself out or to throw itself off balance. I love the fact that the symbol in the Rider Waite deck is a broad sword. A peaceful warrior is conscious of when to use the cutting edge, prefering more often to use the flat of the blade. In other words to invite differences of opinion, to not have to cut down an opposing view but to learn from it. Qualities of respect and to look beyond an immediate issue. A saying of my father's that I reflect on more and more as I get older is "sometimes what's more important than being right, is what gets left". On a more formal level, the business of articulation, mediation and problem solving is where we see Swords (along with the other elements) in the process of developing policy. Any good community group or organization usually has a constitution, a mandate for how it operates and it is out of constructive conflict that we develop the policies and procedures that guide us through challenges. Rather than having to fight the same battles again and again we are able to work with our experience (this involves pentacles - see the September article on Discerning True Worth). The saying that "the pen is mightier than the sword comes to mind, but in truth the pen is just another form of sword. How we communicate and articulate ourselves runs through all the elements but in swords we have the conscious opportunity to either wage war, uphold a principle or set a boundary that allows for healthy discourse. On a more personal level, couples learn to fight fair, to understand each others backgrounds in conflict is important, to not hit below the belt and to see where sometimes a conflict on one level may be an opportunity to work safely with other, sometimes more unconscious issues. It's very challenging in conflict situations to not react but rather to listen and then respond. When someone who has obviously been stewing with something suddenly brings an issue forward, it helps to see they have been preparing for a while. I am an Aries ( ruled by the planet Mars) so I CAN be a hot head. I have had to learn to stand back, to say "I'll have to think about this" and (boy this is still challenging) "while you're at it, is there anything else"? Often for the person bringing the issue forward just the rassurance that they are being heard is diffusing. Sometimes though what comes our way is a tantrum. Thats when you have to stand back, sometimes walk away, give what Eckhart Tolle calls a "quality no". You can't teach pigs to sing, it only makes the pigs angry. Paying attention to the time and place can be important. Saying "could we perhaps address this differently,another place or with other people present) can help. If someone calls me at 11:00 at night that isnt good timing, Also in this age of cyber communication, not hitting send in the heat of the moment, even better saying could we discuss this in another way. If the other person is simply interested in berating and not about to show reason best to walk away. Like I said this stuff is challenging. For myself, I can be a know it all sometimes and having the last word is not always the best thing.Walking away sometimes means to give up the idea of winning, to say "well thats your opinion", or "I understand thats what you feel or think of this". Challenging eh? Sometimes we have to fight our own battles, but relying on outside resource, whether thats as formal as calling in the law, talking to a counsellor or on a less formal but incredibly valuable level, an objective friend, are all healthy applications of swords energy. Sometimes I need feedback not just on the conflict but how it is getting addressed. There are times when we might be right in principle but very wrong in how we address it. I sometimes have to look at even how I bring the issue to that objective person. If even there I need them to agree with me or take my side, I might not be deep down so sure of my own position. 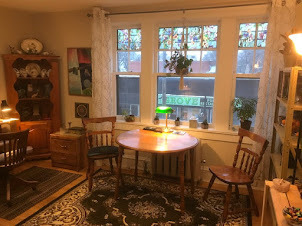 Being present, really listening to others and my own reactions is a discipline, but to not do it is far more draining; like people who yell all the time that others tune out, learning to reflect and communicate without letting anger take over is work, sometimes hard work, but living less consciously takes a greater toll. After a while, like learning to walk it becomes more natural and we dont have to crawl anymore.